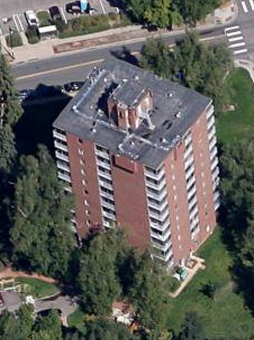 Boulder County’s highest building at 11 stories at the mouth of Boulder Canyon made this project very challenging. Started in August 2008, streets were closed to allow the crane to reach eleven stories off the ground to enable the work to begin and proceed. An overlay on a concrete deck with High Wind application Johns Manville used strikers, invincia cover board and fully adhered 90 mil EPDM. To add excitement the project had no parapet wall and high winds in November. Grabau Roofing completed the project on time and budget and has done several other projects for the same owners since 2008.